Look good and feel great working out with this Bowflex® Blaze home gym, which lets you perform over 60 gym-quality exercises from the comfort of your own home. 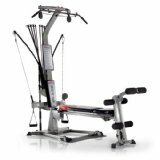 The Bowflex® Power Rod® unit offers resistance or weight that feels as good or better than free weights without the inertia or risk of join pain usually associated with free weights. 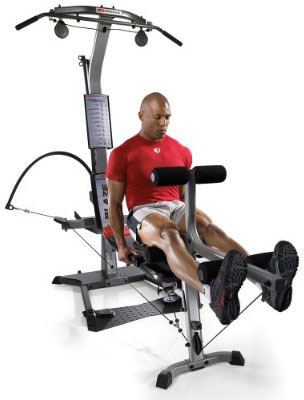 The sliding seat rails for rowing add an aerobic element to your workouts. 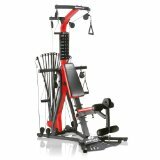 The Bowflex Blaze Home Gym with Power Rod Technology is a serious piece of fitness equipment. If you’re searching for a way to look and feel better, the Blaze will give you fast results, with just 20 minutes a day, three times a week. 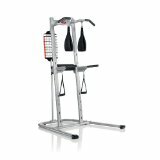 The Blaze offers over 60 gym-quality exercises that work all your muscle groups, and with 210 pounds of Power Rod resistance (upgradable to 310 or 410 pounds) this device offers plenty of room for strength-training growth. The Blaze allows for more than 60 exercises and offers 210 pounds of Power Rod resistance. The Blaze home gym is similar to having a whole resistance training gym tucked right into your den. Bowflex’s lat tower with angled lat bar helps build back and shoulder muscles quickly, and the lower pulley/squat station enables you to do squats and build your glutes, hamstrings and quads. 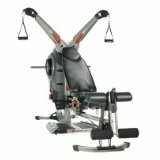 In addition, the Blaze is equipped with a leg extension/leg curl attachment that helps develop strong, muscular legs, and the sliding seat rail allows you to perform aerobic rowing and leg presses to beef up your cardiovascular health. And instead of different handles for every exercise, Bowflex has designed triple-function handgrips and ankle cuffs with multiple cable/pulley positions that encourage custom workouts. But if custom workouts isn’t your cup of tea, Bowflex also includes a workout placard that steps you through the famous Bowflex 20-minute workout. Bowflex Power Rods give you resistance, or weight, that feels as good as or better than free weight lifting — but without the inertia or risk of joint pain that is almost at all times associated with free weight strength training. Power Rod units are precisely manufactured under the highest quality control measures, then sheathed and tested four separate times to ensure quality and durability. Bowflex is convinced that the Power Rod units are so strong that you simply can’t wear them out. You’ll be able to flex them repeatedly, but they won’t lose their resistance or break. Actually, they’re so strong, Bowflex has given the Power Rods a no-time-limit warranty. If You’ll be able to wear the Power Rods out, Bowflex will replace them for free. strength training is when you perform exercises with resistance to build muscle strength. Strength training is not running on a treadmill, riding a stationary bike, or using a ski or rider machine. Even supposing these types of aerobic machines use “resistance” to increase cardiovascular workout intensity, it is still not the same as strength training. strength training is, essentially, weight lifting. But don’t be discouraged; you don’t have to get bulky muscles if you do not want to. 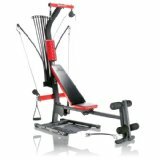 With Bowflex Blaze You’ll be able to shape and sculpt your muscles to make your body look the way you wish to have. It just takes persistence and dedication. Why does strength training work better than aerobics for getting fit and losing fat? Because the more muscles you have on your body, the higher your metabolism rate, and the more calories you burn. Muscle also creates the shape of your body — muscle is what makes you move, it’s what gives you energy and strength. Of course, this doesn’t mean you should abandon your aerobic exercise — cardiovascular exercise is necessary for a healthy body — but the combination of aerobic and strength training will help you achieve your fitness goals. Muscle acts as your body’s fat burners. It’s the stuff that makes you active and makes you burn calories. If you wish to lose fat, you wish to have to strength train with the Bowflex Blaze to add muscles, burn calories, and look fantastic. 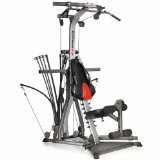 Bowflex Blaze home gym, lat bar, leg extension/leg curl attachments, triple-function handgrips and ankle cuffs, 20-minute workout placard, and owner’s manual/fitness guide.